You can see these on your mini map like the air supply drop if one is around. I found one in a cave, just north of Deadwash. Drustvar: Inside the house just SW of Arom's Stand. 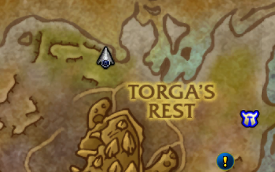 I sat at the spawn in Zandalar for more than an hour, probably close to an hour and a half or longer, before the chest ever spawned. Either it's a bug, or it is a very long respawn timer. Anyone found one in Tiragarde this morning? Been circling forever but to no avail. Can confirm its identical to the ''Air drop Chest'' Same icon on minimap. Stormsong Valley: Spawned under a tree southwest of Deadwash (40, 62). Just as a quick note, it seems like these may be either one-time only, or a weekly lockout. A third friend came along with two of us in party to the Vol'dun invasion tonight (12/17/2018) and while the two of us had not looted the Vol'dun secret cache for the week, we were both able to loot it, however our third friend was completely unable to see it either on the minimap or in world and he had looted it earlier in the week. Will update and edit this comment next weekly reset (12/18 or later) as to how it behaves after a weekly reset. EDIT 1/13: This was for the first 2-3 weeks a one-time loot. It was hotfixed soon after to be lootable every assault. Secret Supply Chest appears on mini-map just like the War Mode Air Drop chests if you are in the area when it appears. Must loot it quickly since they don't last very long. Both Alliance and Horde can loot them. It is possibly unable to see them if you have previously looted one in that same zone during a different assault in that zone even if it was during a different week. Edited and Updated on 12/23/18. I've been able to loot two, one each in two different zones, but there are definitely chests I am not seeing. It looks to me like a weekly lockout. These appear to share the daily quest with the "air drop chest" that grants conquest and the larger sum of azerite power. There is not a lockout on looting the chests for this achievement with the possible exception of the same zone that an assault takes place. these seem to either despawn on a timer, or after X amount of people loot them. During off peak hours a chest in zuldazar (70,37) lasted 10 mins before i ran off, could of been longer. My guess is once they spawn they'll either despawn after possibly 5-15 mins or once a certain amount of people loot it, whichever comes first. PS: i was running around for a good hour waiting for zul chest to spawn, seem to be a long respawn time. 1) Can you loot this in a raid? 2) Do they come in set spots? Or completely random, like they could drop on a tree? If there are set spots then maybe we can collaborate and make a map to check the spots. There is more to these chests than what is told here. I just stood infront of nazmir chest, see other people loot it, BUT I cant see the chest my self. 1 in party looted item, others just come later, but I still couldent see the chest....Even tried re-logging. For context, I definitely have seen the Nazmir one spawn in the exact same spot as last times, so there is definitely a fixed spawn points and a map you could build. I would personally recommend just straight camping one of the spots via Stealth (as a Rogue, or Prowl or Shadowmeld or Potion of Concealment) and sticking in that spot, and using server hopping (either via addon, or just scrolling and joining groups in the zone to join other 'shards'). This is a compilation of other comments, so credit goes to them. You need to be in Warmode to see this chests. Cache is visible on the minimap, marked with a chest with crossed swords behind it. Caches are lootable once per incursion, up to 7 times per week (each day one, since they have a daily cooldown). They are not always up, so you might want to camp spawn point or use realm hop. Joining groups doing World Quests is easy way to get onto other shards. Chest despawns in a couple of minutes or after a certain ammount of players looted it (speculation). Loot contains a random PvP blue ilvl 330, like random battleground rewards do, and conquest or honor points. Loot is shared with regular air drops and can be obtained only once per day. It is not, however, shared with bounties for assassins. Edit: added/corrected some coordinations based on comments, not verified by myself though. It's near a Horde only version world quest, once there just shard hop using the Artillery Master Goodwin world quest. If on war mode and the chest is being ganged by Horde/Alliance use the Whole-Body Shrinka' to give you that extra time to loot! Thanks to a very helpful DH for this tip! I'm not sure these chests had the intended goal/effect. I'm only missing the one from Vol'dun so I'm just sitting on my druid, stealthed in between two spawn points as my efforts to find the boxes by realm hopping did not work. I'm going to just sit here until one of them pops up and hope it isn't the third spawn point over and over (assuming it ever spawns). Edit: My nefarious plan worked and I got my last chest. You can camp between the north spawn points in Vol'dun and see both of them. Hunters out there if you use your Eagle Eye Eagle Eye there are locations where you can watch for each of the Secret Supply Caches. For example, in Stormsong Valley I stood on the roof at 43.6, 55.4 in Deadwash, from that location I checked each spawn point until it spawned and I was able to loot. It seems that some of the content of the chests involved with this achievement are on partial lockouts. I always assumed you could only loot one per invasion but there's some nuance as well. The conquest inside the chests are on a daily lockout. Yesterday I did an incursion in Drustvar and looted the chest and got the usual Azerite Power, Conquest, and random gear. Early this morning, 40~ minutes before daily reset, I opened another chest during the Zuldazar incursion and I got Azerite Power, Gear, but no conquest. In case you're wondering, my conquest cap was not full and I was obviously in War Mode as well. Or is there something else I'm not realizing?